Club member Wim Raeymaekers has been working for many years on his new book. It's in both English and Italian and with over 400 pages. It uncovers the true story of Moto Morini. The journey has taken him to Italy many times and has interviewed 'the old staff' to record Moto Morini's history. This is a complete history of the founder Alfonso Morini and his team. This has never been published before and the myths have now been sorted. Wim has found the truth and the facts are in this book. Also the racing history of Moto Morini and it's champion rider Provini on the 250GP racer (masterpiece of Nerio Biavati) is there. There is a very helpful list of all motorcycles, mopeds and prototypes, including specifications produced by MM. A must for Christmas for Moto Morini fans! (Location in Antwerp: Noorderlaan 109, 2030 Antwerp, Belgium, time 11am - 19pm). From December 15th 2018 onwards, North Leicester Motorcycles (NLM) will be permanently closed for business. First of all, we would like to thank Stuart and his colleagues for supplying us with parts to keep our bikes rolling. We hope Stuart will enjoy his well earned retirement! 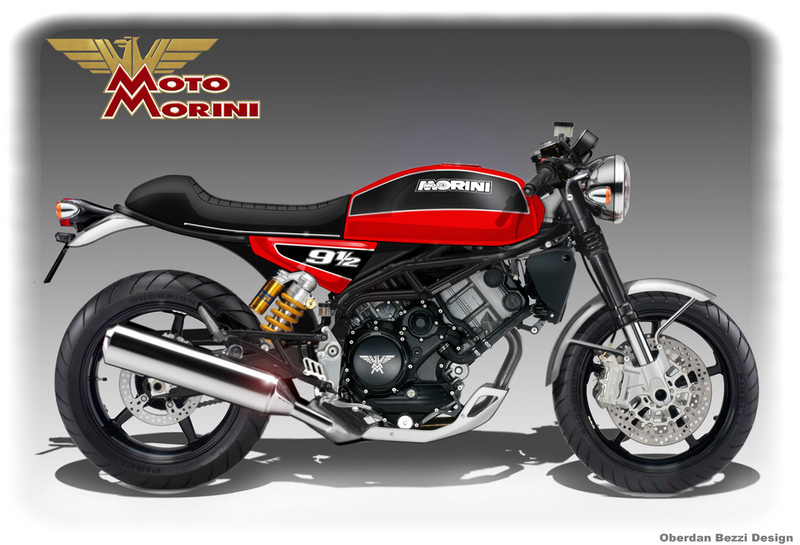 Fortunately, a new company has taken over NLM's Moto Morini parts. In 2019 go to Mdina Italia Store. As soon as "Morini spares" is visible in the section 'catalogue' on their homepage, you can order your parts. Sales of NLM motorbikes will be taken over by Lusso Veloce, see their website. Late September 2018 your webmaster joined the 28th Piston Rally, organised by Moto Club Piston from Santander, Spain. It took a while, but now there is a photo album on-line. It helps to get a good impression of fantastic week of motorcycling in the North-West of Spain. The 2015 album can be found here. During the weekend 1-3 June, the yearly meeting of Moto Morini Club Italia took place in Morano-sul-Po. Our Clubmember Hans visits this meeting nearly every year. He made photo's and collected photo's made by others (like Giuliano) and published them in an online photo album. 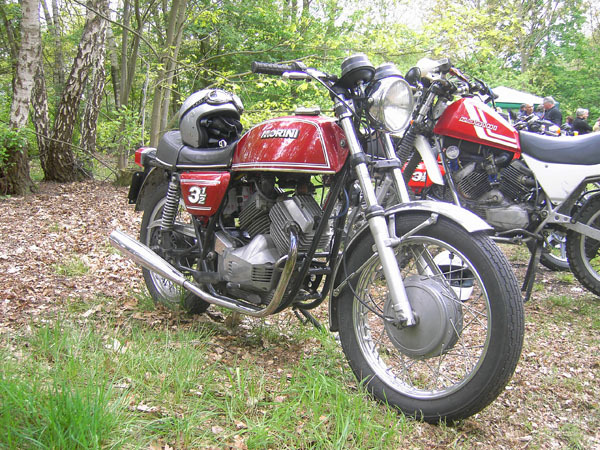 The British Morini Riders Club (MRC) is currently exploring the possibility of having a limited number of new Dart 350/400cc fuel tanks made. The original plastic tanks are unavailable and many are now developing leaks. The MRC has been in discussion with a company specialized in making high quality parts for classic British sports cars. The new Dart tanks will be fabricated from aluminium and following the form of the original tank as closely as is practicable. A flange for the original fuel tap will be incorporated but additionally the MRC will include an extra boss so that a more readily available fuel level sender can be fitted, as these are one of the Dart's weak points. For this project to work, the MRC needs secure orders for a single batch of around 20 tanks. These will be priced at approximately £ 440(excluding postage & packing). This project's objective is to keep Morinis on the road, so the MRC seeks only to ensure the costs incurred are covered by the price of the product. It's the MRC intention to have a specification, order numbers prices completely confirmed by Christmas, for fuel tank deliveries during April 2017. If you are interested, please contact Tom Farrow of the MRC by e-mail: webmaestro (AT) morini-riders-club.com (AT) change in @. Raffaele from Italy wrote to us that a new Italian forum has started on the 1200cc models. "The forum is called Corsacorta.it and it has the auto translator! http://www.corsacorta.it is officially supported by Moto Morini motorcycles (the factory). Enter the forum and write in english. There is also a translator to read the threads. In the forum two important officials of Moto Morini participate, the actual tester and the developer/former tester. This way you have have support!" Some time ago, your webmaster bought himself a 'project bike'. The bike was not found in a forgotten henhouse, but in a normal garagebox. Unfortunately, it had been left standing there for years. Certain parts were missing. Meanwhile much progress is made the get the bike back in it's old glory. Early November 2014, after a complete overhaul, the engine went back into the frame. See the present state at the bottom of this page (and also the work that still needs doing). This year, the annual 'Ital Day' was held on the 17th of August. 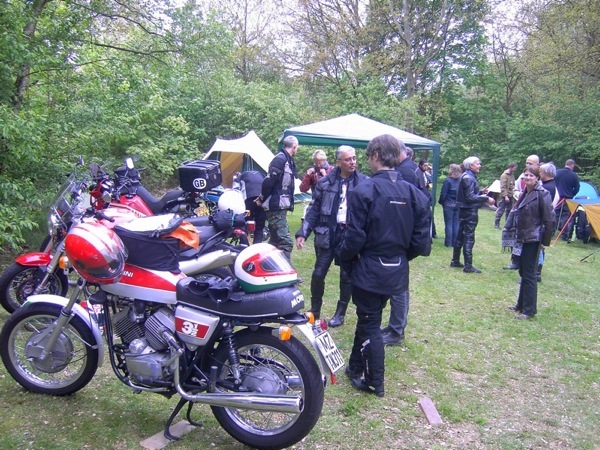 Clubmembers and individual visitors showed their Italian motorcycles. Ren?an der Brandt, member of Ducati Club Nederland, sent me a link to an on-line photoalbum to share the pictures he made. Please note: pictures are free to download, but in case of any kind of publication it is appreciated to add the name of the photographer, Ren?an der Brandt. BTW, according to the jury, the Moto Morini 250V (the red one on the pictures) was nominated "as the most special bike built after 1980". In the past we have seen superb motorcycle designs of Oberdan Bezzi, including Moto Morini. Just use use Google to find them on-line. Bezzi is an Italian designer with the gift to connect 'old' and 'new'. He works in such way that the new design is clearly recognised on the basis of style elements of the old design. On paper he has created a series of new Moto Morini models which are inspired on a number of very successful models from the past, like 350 Sport, 350 Touring and 500 Camel. Unfortunately, the factory did not do anything with these designs. For this reason, friends from the German Moto Morini forum (www.ital-web.de) have taken the initiative to actually build one of these bikes! Old-and-new united: the lines of the legendary 3 1/2 are transferred to a 1200cc bike. You can follow the progress of this project on the special website for this project, see for yourself! Your webmaster joined Milano-Taranto for the second time in July 2012, after the first time, back in 2007. Milano-Taranto is a 2,000km's (1,250 miles) motorcycle rally in Italy, based on the idea of the streetrace from the 1920-1950s. Fortunately, these days it is not a race, but a rally in six stages with a classification. The distance of each stage is app. 350km's (220 miles). First stage starts traditionally at midnight and took the riders to Vicenza near Venice in the North-East of Italy. Read the complete story of this great motorcycle adventure through this link. The Moto Morini international mailing list has got a new host. If you want to join, register through this link. To get an idea, here you will see bikes of some participants of the mailing list. A rather international matter with owners/bikes located in Australia, Canada, Belgium, Denmark, Italy, the Netherlands, Norway, New Zealand, South Africa, United Kingdom and the United States of America. It is remarkable to realise that Moto Morini has been on the basis of desert rally's, like Paris-Dakar in the early 80s. 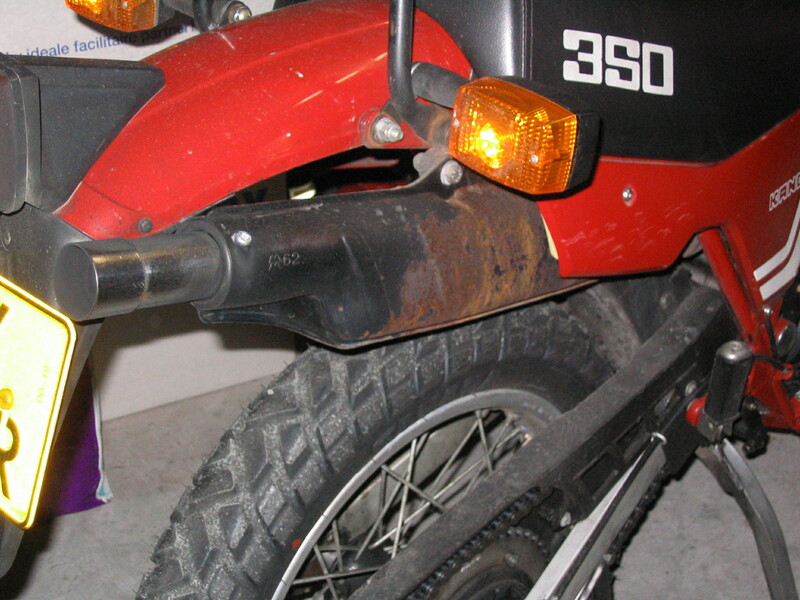 At the time, the Morini Camel 500 and also the BMW GS80 were the first 2-cylinder offroad bikes. 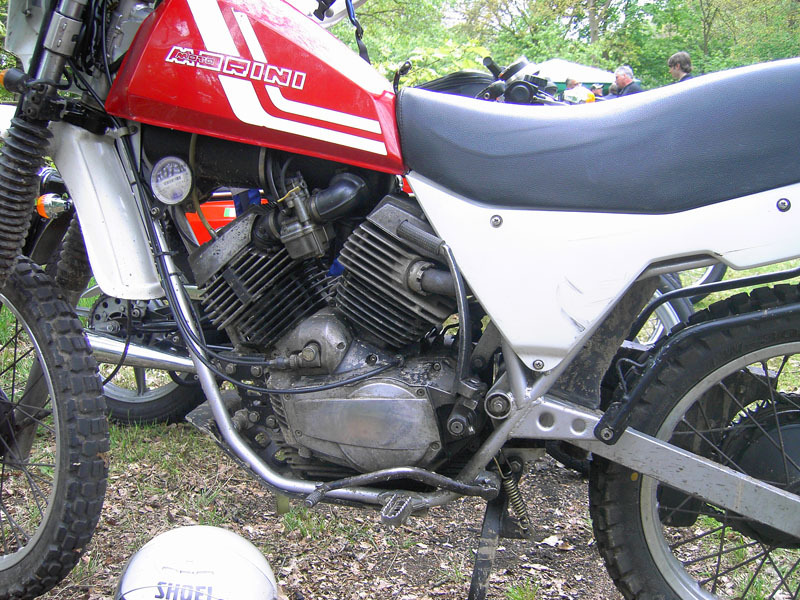 The Morini had real offroad capabilities. 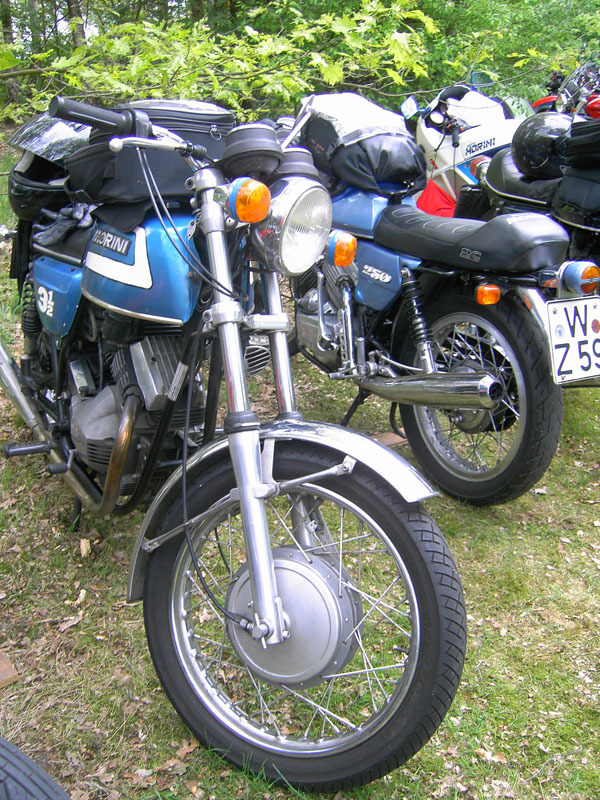 The BMW became a very successful bike as a 'travel enduro'. The Morini Camel 500 was developed by a private company, Valentini Moto, with the help of ing. Franco Lambertini. Soon after, the factory took the Camel into production. Read more on Antonio's son Massimiliano who was a keen rally rider. The new management of Moto Morini have changed marketing and sales strategy. 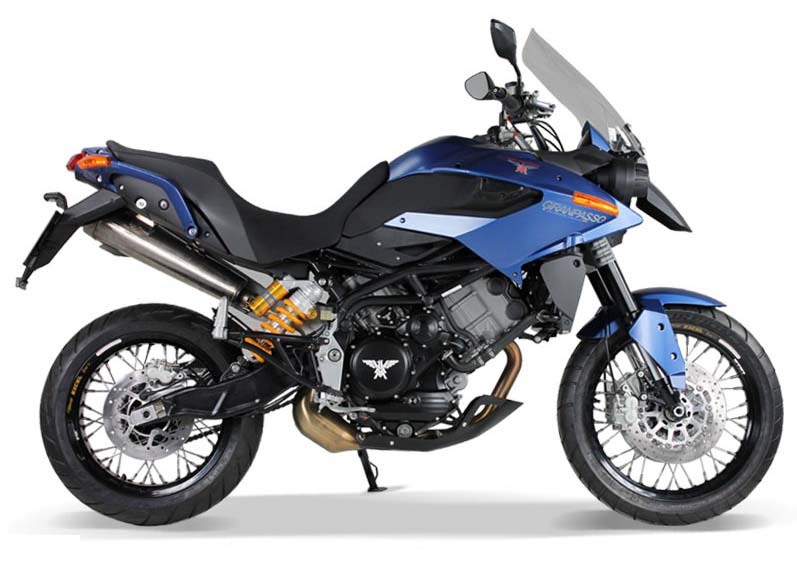 Bikes like the Corsaro/Granpasso or Scrambler can be bought directly from the factory. 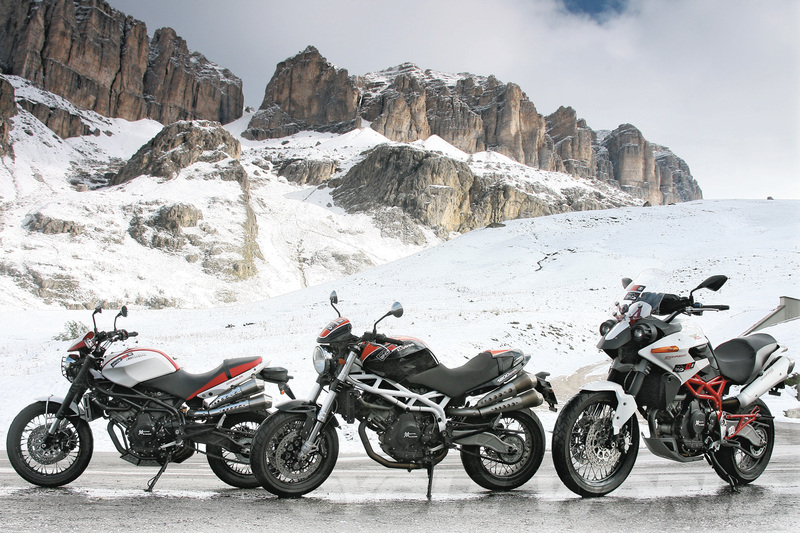 The company invites potential buyers for a day of test riding, at it's location near Bologna. Various airlines offer cheap flights to this city. After an appointment, potential buyers are taken from the airfield. At the factory, all 1200cc models are available for an extensive testride. After that, the potential buyer can compile his/her dream machine and order it. Many new colours are available and prices are very competitive. After the bike has been produced, the buyer can collect the new motorbike, or get it delivered to any dealer. These new methods of sale and distribution also have some disadvantages: and for this reason the former German importer M? has discontinued it's activities for Moto Morini. The British Dellorto importer Eurocarb ltd. kindly supplied us with two pages from a Dellorto catalogue. In this catalogue an overview of the carburettors used by the factory on the various 125/250/350/500cc models. Of course also details on the (standard) jets, needle, float and slide are included. Photo pages of the 21st international Moto Morini meeting, held in June 2010 in Morano-sul-Po/Italy. Finally, your webmaster finished the pages about this very nice meeting in Italy. This time not a written report, but photopages instead. Let the images tell the story! Frequently we receive question with regard to badges for the 350/500cc models. Also the Sport badge on the cockpit for certain models is wanted. Unfortunately, even in Italy it can hardly be found anymore. A Morini owner from New Zealand made new ones CNC machined. According to us: a very neat job and worth a mention and a link. 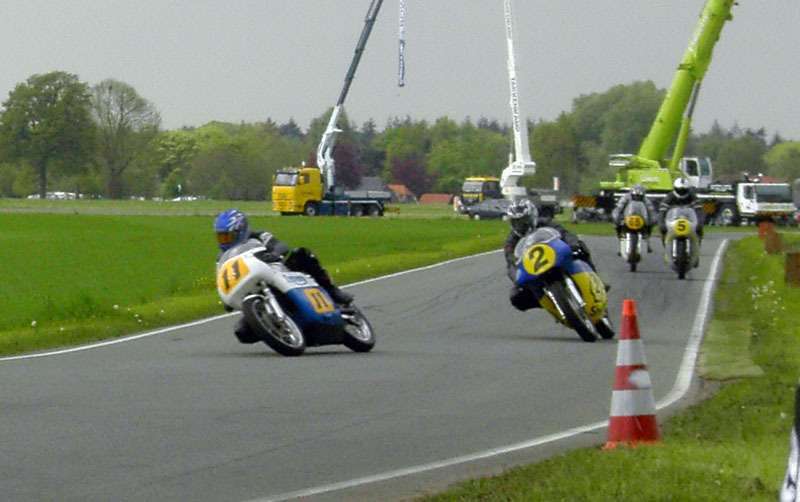 The 25th anniversary celebration of Moto Morini Club Nederland took place on May 15/16. On Friday, the first participants arrived in Hengelo (Gld). On Saturday morning, most of the participants had arrived. We welcomed a delegation of six Morini Riders from Brittain, as well as six participants from Germany, three of our own Clubmembers from Belgium and last, but certainly not least: S?n came all the way from Denmark!! A trip of ±650km's (over 400 mls) one way!! The 'benzina' magazine is very much worth it. Very different to the usual, not only the square book like format, but also the quality of print and of course, the very unusual stories on Italian motorbikes. Stories you don't read so much North of the Alps. Unless perhaps, you own an Italian bike yourself. In that case it's still worth it, as you read about makes other than your own. In benzina 01, (the spirit of the open road), 15 different stories of Italian motorbikes, written with different perspective. Ducati, Morini, Mondial, Gilera, Guzzi, Laverda, the lot. Anyone into Classic Italian bikes should try this new magazine. And it's not a magazine which you finish in 10 minutes either. Well, enough of this, see for yourself. ISSN 2043-0744 and see teambenzina.co.uk or telephone: +44 (0)1380 812176 Greg Pullen, the initiator, has done an excellent job! Think such an brave initiative should be supported in economic difficult times. For a long time it was impossible to buy replacement exhausts (mufflers) for the Kanguro and Camel models, as production of the original Lafranconi's stopped. 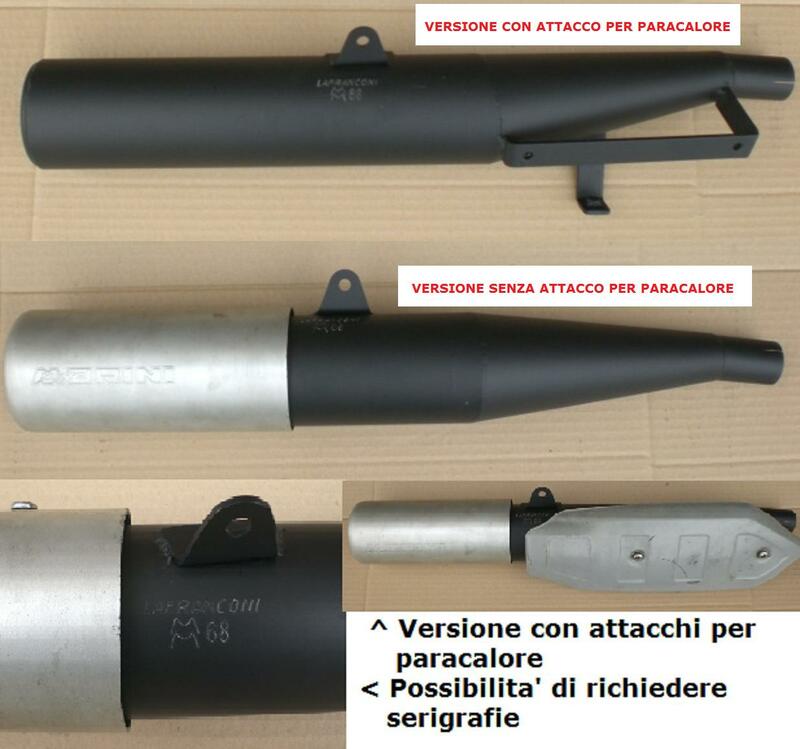 In Italy and Germany replacement exhausts are available. German Morini dealer Wolfgang Tritsch. 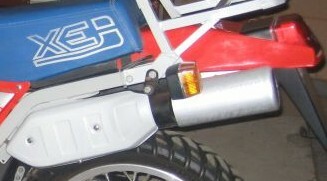 The X/X1 models have a 2-into-1 exhaust. replacements for the Kanguro X2 and Camel are advertised on the website of Moto Morini Club of Italy. The X2/X3/Coguaro models have a 2-into-2 system. 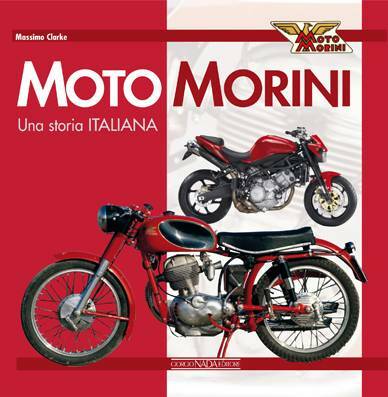 We have extended our stock on owner manuals and part catalogues for many Moto Morini manuals. Have a look on the new page. Of course your can order them on-line through the form at the bottom of that same page. In the 1960?s, Moto Morini were very successful at motorcycle racing. In this story, published in 'Motor Cyclist Illustrated' from 1964, you can read about the role of the Morini founder Alfonso Morini (1898-1969). It explains his cooperation with a number of others, which helped Tarquinio Provini to nearly becoming world champi on on the 250GP racer back in 1963. He only missed out by 2 points in that year. In 1963 Tarquinio Provini was 2 points short to become Worldchampion 250cc. In "Legend Bike" no. 139 from April 2004, there was a very interesting article on Provini's 250cc Moto Morini racer, written by Paolo Conti. We are fortunate to present both an English as well as a Dutch translation on this very interesting "fastest single of the world". Repair for leaking mono shock absorbers on the Kanguro is possible in Germany. Follow this link. In 2005, all eyes are focussed on both the new Corsaro 1200 and 9½ models (see elswhere on this page). 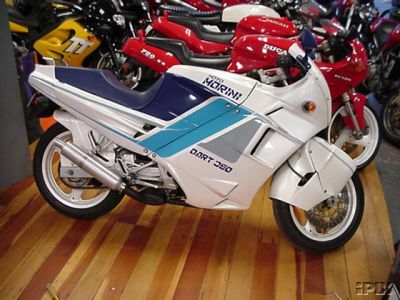 In 1982 however Moto Morini was working on a 500 Turbo. A bike which never was taken into production, but the British magazine 'Bike' published an article about the development of this model. A 'must' for Moto Morini enthousiasts! The 500 Turbo was also mentioned by ing. Franco Lambertini in his interview with Motociclismo d'Epoca (Aug./Sept. 2002). You can find the 'Bike' article following this link. Italian magazine "Motociclismo d'Epoca" of September/October 2003 published a buyers guide of the 3½ Strada/Touring model. 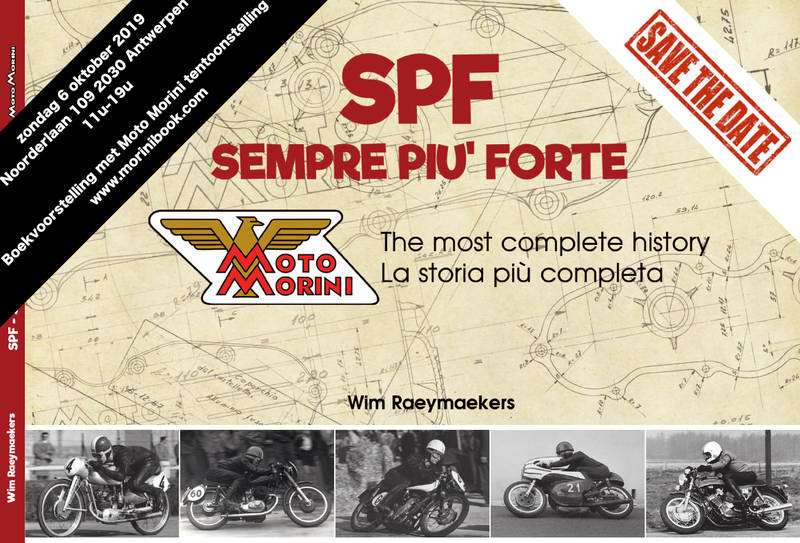 Moto Morini Club Nederland proudly presents the English and Dutch versions of this excellent article. Moto Morini built mopeds in the 1960s and 1970s under the name "Corsarino" (=little Pirat), other factories used engines made by Morini Franco Motori. This article explains the differences. 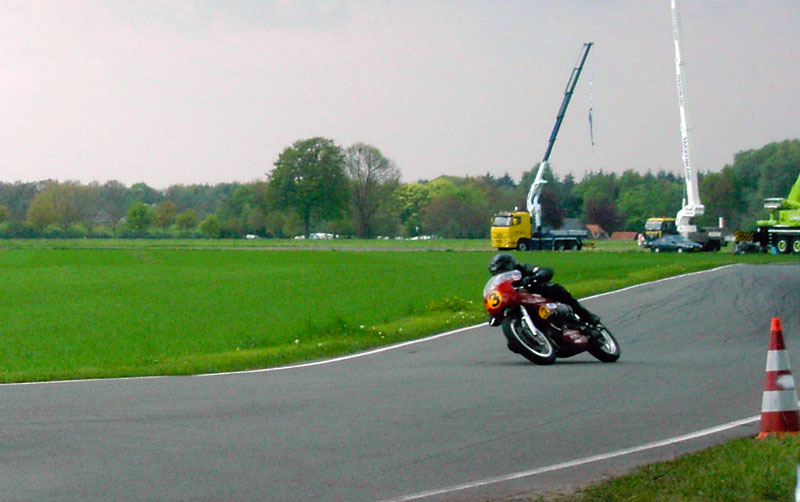 Club History Moto Morini Club Nederland was founded back in 1985 by ms. Lil Kremers from Tilburg, the Netherlands.